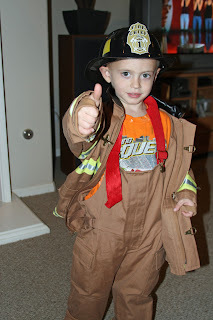 Papa Jim and Grammie Sue came down the mountain to give Caiden some authentic looking firefighter gear. Caiden was SO surprised and LOVES IT! I mean LOVES IT. He refuses to take it off, even when he is sweating in it, and when he goes to bed he lovingly hangs each piece up in the closet. Upon waking in the morning, he runs to his closet and gently takes it down so he can put it on again. He was very upset when I explained that he could not wear it to school, and we had to have a discussion. When I picked him up from school he was anxious to put it back on. 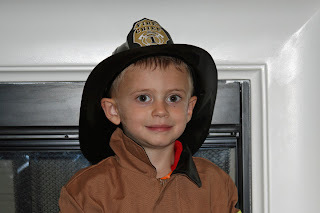 When I gave Caiden his outfit he started clapping and laughing and said "I am so happy, I love everything about it". 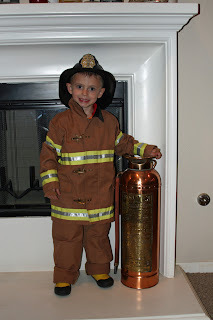 Here are a few pictures of Firefighter Caiden Bonney. 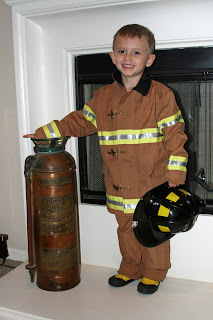 He is so excited that he dressed just like his daddy. This picture was specially taken for Papa Jim. He even said "Good Job" while the picture was being taken. 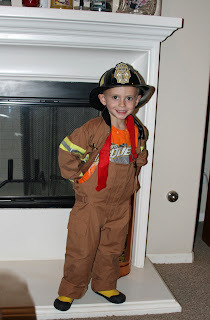 Thanks soooo much for posting him in his new firefighter costume!!!!! We love it and am glad that he does too. Can you please get a picture of him with his jeep? If not now maybe later and we will get his name embroidered on the jacket after Halloween. That is so cute! Is he going to wear that for Halloween? Very cool. Great outfit. Good job Mom and Jim.